Will Congress protect retired coal miners? June 22, 2016 by Ken Ward Jr.
Photo by DYLAN LOVAN / AP — United Mine Workers of America president Cecil Roberts speaks to about 4,000 retired members at the Lexington Center in Lexington, Ky., last Tuesday. Roberts urged members to push for legislation that would protect pensions and health care benefits for retirees that have been put in jeopardy due to a downturn in the coal industry. There’s been a growing public push for Congress to take action on legislation to rescue the troubled health-care and pension funds that provide for tens of thousands of retired United Mine Workers and their families across our nation’s coalfields. 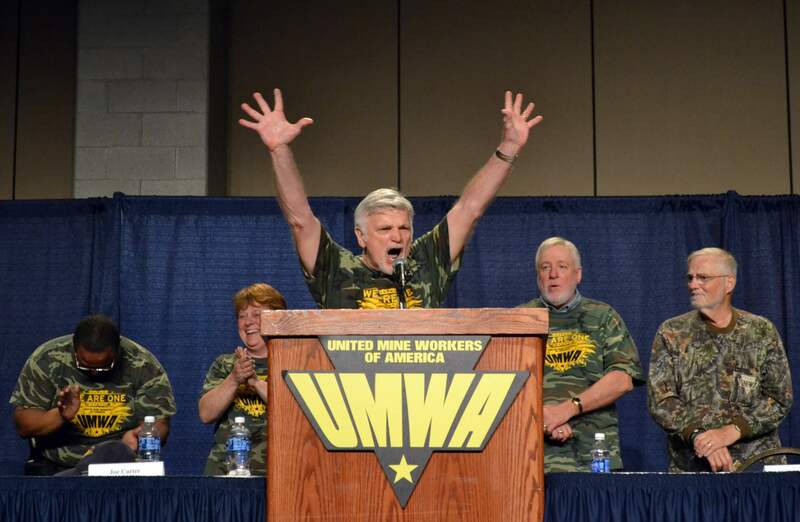 United Mine Workers president Cecil Roberts told the gathering in Lexington of about 4,000 members from seven states that miners spent their lives working in dangerous places to provide the nation’s electricity and steel. The miners, some of whom arrived in wheelchairs, don’t deserve having their benefits put in jeopardy, Roberts said. “What do they want these people to do, get out of their wheelchairs and go back to the mines?” Roberts remarked after the rally. That rally followed a series of Senate floor speeches last month by Democrats, calling for action on the bill, and a letter by Sen. Joe Manchin, D-W.Va., and others urging Senate Majority Leader Mitch McConnell (whose role in blocking the measure was documented by the Washington Post) to act on the legislation prior to the summer recess. We’ve had more about this legislation previously here, and a more detailed Coal Tattoo explanation of the problem here. The proposed fix, which has supporters in both parties, is to tap fees the coal industry pays for leasing rights and cleaning up abandoned mine sites and the interest, some of which already go to the miners’ health fund. If those sources fall short, the Treasury (taxpayers) would make up the difference — an option reviled by conservatives as a “bailout” for organized labor and a dangerous precedent. McConnell excels at pro-miner rhetoric. But what the pensioners, widows and coalfield communities need from him now is a clear answer. They need to know what, if anything, he intends to do to preserve the pension and health benefits they were promised. And they need to know without delay. … Today, there is a looming health-care tragedy unfolding in the coalfields, with potentially devastating human effects. In many cases, the loss of health-care benefits will be a matter of life and death. In all cases, it will be a financial disaster that the retired miners, who live on very meager pensions, will not be able to bear. Coal Miners are paid an above average hourly rate. Probably don’t save much for the future? But I say NO to a US Government bailout.